ecorn-cf: lt Edvardas Danila, Assoc. Prof., Ph.D., M.D. Present position: Pulmonologist, MD, PhD, Assoc. Prof. Physician, MD, Medical faculty of Vilnius University (1992). PhD, Medical faculty of Vilnius University (1999). 1992–1994 Fellow in training in internal medicine, Vilnius University Santariski? hospital, Vilnius, Lithuania. 1994–1996 Fellow in training in pulmonary medicine, Clinic of Pulmonology and Allergology of Vilnius University Santariski? Hospital, Vilnius, Lithuania. September 1997 Course “Update on the current use of BAL in clinical practise”, Berlin, Germany. September 1998 Course “The non-invasive diagnosis of pulmonary hipertension”, Geneva, Switzerland. February 14–20, 1999 Salzburg-Cornell seminar in Pulmonology and Cardiology, Salzburg, Austria. March 2–4, 1999 Training in Klinikum Nürnberg, Nürnberg, Germany. March 20–April 15, 2000 Training in Division of Pulmonology and Division of Thoracic and Cardiovascular Surgery in Medizinische Hochschule Hannover, Hannover, Germany. June 18–20, 2001 As representative of Lithuania at the Pan-European Regulatory Forum on Pharmaceuticals (PERF) participated at the European Agency for the Evaluation of Medicinal Products (EMEA) Efficacy Working Party and Dossier Assessment Efficacy - CTD Training, London, United Kingdom. November 26, 2001 As representative of Lithuania participated at the EMEA Workshop on ''Ethical considerations in clinical trials'', London, United Kingdom. September 5–7, 2002 international Norway and Baltic countries conference ''Ethics in research'', Sigulda, Latvia. 1993–1996 Vilnius First-aid station, Internist. 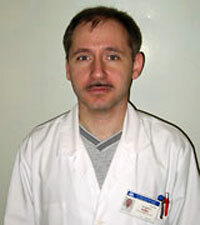 1995–1999 Clinic of Pulmonology and Allergology of Vilnius University, Assistant Professor. 1999–2004 Clinic of Pulmonology and Radiology of Vilnius University, Lecturer. 9 medical teaching books. 75 original articles in representative Lithuanian’s medical journals, 28 Papers (abstracts) at international congresses and Journals. 50 oral presentations at national conferences, 30 presentations at international congresses.